Cinnamon Toast with Cereal Milk brings back familiar flavors from my childhood. It turns my childhood favorite cereal, Cinnamon Toast Crunch, into an "adult" breakfast! In a large bowl, soak the cereal in the milk for 20 minutes. Prepare the cinnamon toast during this time. Once the cereal milk is done soaking, strain out the cereal using a fine strainer. You may need to let the cereal sit over the strainer for about 5 minutes, otherwise you can gently push the cereal against the strainer using a spoon, being careful not to allow pieces of soggy cereal through the strainer. In a small saucepan, simmer the cereal milk with the condensed milk for about 5 minutes. Remove from heat. Slice the sourdough into 3/4-inch slices. In a small bowl, mix together the butter, sugar, cinnamon and vanilla extract. Spread the butter evenly over each slice of bread, making sure to spread the butter all the way to the edges. Bake for 10 minutes. Switch to the broiler, and broil until the tops of toast are golden brown. Plate the cinnamon toast and gently pour the warm cereal milk over it. Serve immediately, or let it soak for about 5 minutes if you prefer. 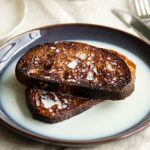 Get this recipe for Cinnamon Toast with Cereal Milk at https://www.theworktop.com/breakfast-brunch-recipes/cinnamon-toast-with-cereal-milk/.